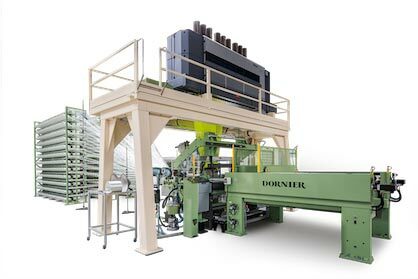 Tapes, tape fabrics and 3D structured textiles: DORNIER presents machines and system solutions from its Composite Systems business unit for efficiently manufacturing the latest in semi-finished fiber composite products at JEC World (March 12-14 in Paris). "At the JEC we will present the full range of our machine and system solutions for the composites industry", says Dr. Josef Klingele, Head of Composite Systems. 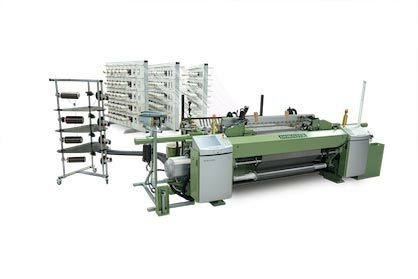 For tapes, tape fabrics and complex 3D fabrics, in the machines and production lines of the Composite Systems range, set up in 2014, the machine builder combines the unrivaled expertise collected in its globally respected Weaving Machines and Specialty Machines business units. Particularly with the extremely versatile Roving weaving machine for processing high-performance materials like carbon, glass and aramid fibers, the family company on the shores of Lake Constance has been the preferred partner for technical weavers worldwide for over 40 years. With core skills in textile and plastic processing collected in its Composite Systems business unit, DORNIER is building its reputation as a reliable equipment provider partner for the burgeoning composite industry. Very high dynamic loads, good impact resistance and outstanding damage tolerance – it is often the case that the requirements placed on modern composite components simply cannot be met with layered textile reinforcements. The solution: multilayer, integrally reinforced 3D fabrics. These can be produced economically on 3D weaving machines from DORNIER. With an innovative fabric guidance system, fabrics can be manufactured with thickness of up to 100 millimeters. For this, the textile weave pattern is first developed in a virtual environment and then transferred digitally to the weaving machine controller. "Manufacturing technologies are in a permanent state of evolution and optimization", says Klingele. These days, both dry and fully impregnated tapes can be produced in widths up to 600 millimeters on the DORNIER tape production line at manufacturing speeds as high as 30 meters per minute. Then, the finished tapes are processed further on the tape weaving machine to create textiles which are ideal for structural reinforcement and design applications. "The latest machine generation is now available for fabric widths up to 285 centimeters", adds Klingele. This represents a significant increase in productivity and less waste particularly for applications involving thermoplastic composite materials. The challenges facing the composite industry are enormously diverse; no two machines for manufacturing semi-finished goods are the same. In order to meet specific customer requirements, DORNIER has established its own technology center where it develops and tests complex machine and system concepts for optimal production of semi-finished products jointly with the customer. For example, trials are conducted in a tape laboratory facility here on the manufacture of thermoplastically fully impregnated tapes, and of tape-based fabrics on a tape weaving machine. 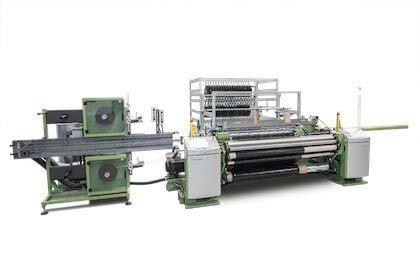 A 3D weaving machine for complex multilayer fabrics and a high-performance weaving machine for flat weaves are also available for running tests. "It is just not possible to make the high-quality textile reinforcements needed for cars, aircraft and machine building on standard machines", says Klingele.